Have a piece of heirloom silver that has lost its luster? 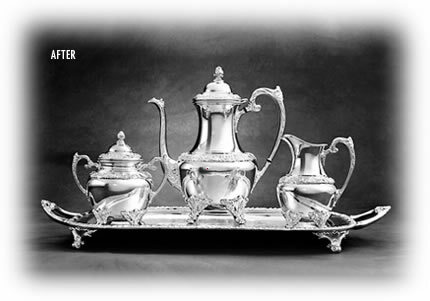 Whether silver, brass, pewter or copper, Fleming’s can repair, replate, polish or lacquer it, restoring its original beauty. Bring us your silver combs, mirrors, or brushes. Fleming’s can also replace knife blades at reasonable prices. All silver is quadruple plated, carries a 25 year guarantee, and includes free dent removal and straightening.